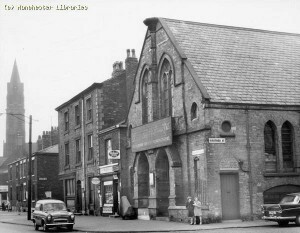 St.Casimir’s Church was on Oldham Road on the corner of Reather Street. The Priest’s (Rev.Foltin’s) house was at no.1 Reather Street, behind the church. In 1901 this building was a Methodist Free Chapel and is built in that style. It was bought in 1925 for £8000 by the Poles, Lithuanians and Ukrainians (Rusny). It had the only gold incense burner in England at the time. There was also a school for the children. Various Lithuanian priests were invited from time to time: Fr. Ilgys, Prel. Ladyga, Fr. Gečys, Fr. Slavinas and Fr. Staškūnas. In 1931, the St.Casimir Society was founded. It had about 40 members and was led by V.Valinskas. Fr. Ladyga took care of Lithuanian religious matters. It is not clear when the Ukrainians seperated from this community. In 1931, Bishop Andrey Sheptytsky and Fr. Josyf Slipyj, both of the Ukrainian Greek-Catholic Church, made a pastoral visit to Manchester. A Ukrainian Catholic congregation was established at St. Chad’s RC Church in the 1930s, which continued until the Ukrainian Catholic parish became established at its present location on Bury Old Road at the Dormition of Our Lady Church. Due to various political tensions in Europe, the relationship between the local Poles and the Lithuanians broke down, there was not enough money to pay the loan and so the Bishop of Salford passed the church to the Poles in 1934. In 1961, when the photograph was taken, it was a garment factory. Locals mentioned you could see the ladies working on the sewing machines making raincoats in the basement. These days, Reather Street has disappeared and the site of the church is covered by grass. This used to be St.Casimir’s Church, photo taken in 1961. My Grandfather and Grandmother were married by Father Foltin at St Casimir’s Chapel on 6 February 1910. Their names were Simon Vaitkunas and Constantia Neszukaicziute. Simon had a brother, Joseph who lived with his young family in Abbott Street Collyhurst in 1901 and in Livesey Street in 1911. Constantia was living at 3 Nelson Place, Rochdale Road at the time of her marriage. I would be very grateful if anyone knows anything about the Vaitkunas (Waitkunas) or the Nszukaiczas families and can help with my research into their history. My mum got baptized there at the church and my gran & grandad Predergast got married there. Most of my aunts & uncles worked at the raincoat factory that took over the church when it closed down, called Libets. I went into the buildng many times after school etc.